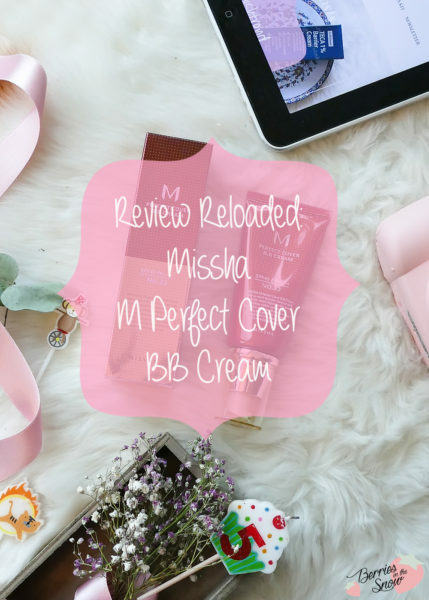 In honor of my 5ths Blog Anniversary I want to redo my review on the one BB cream that started everything: the Missha M Perfect Cover BB Cream! Many years ago, I was looking for a BB cream that helps to give some natural coverage and yet was good for troubled skin. 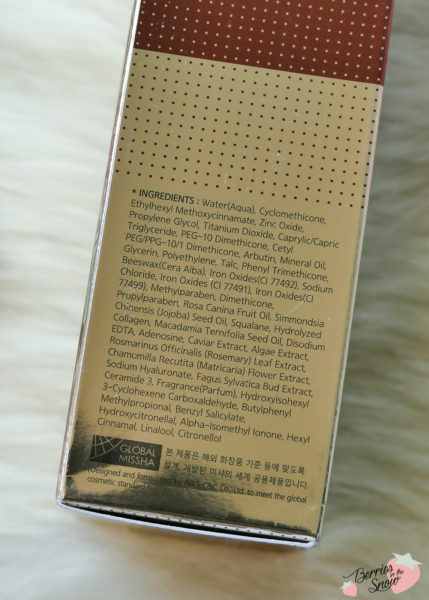 While searching the world-wide web I discovered a particular interesting review, and that is when I decided to by my first BB cream from the korean brand Missha. I ordered via ebay and waited eagerly for 2 weeks before I received my travel tube of the Missha M Perfect Cover BB Cream. It came in a small cardboard box together with some samples of it and a cute note. Unfortunately, I don’t remember from which seller I bought this particular tube, but I was so wowed that I bought back-ups and up to today this is one of my favourite BB creams! 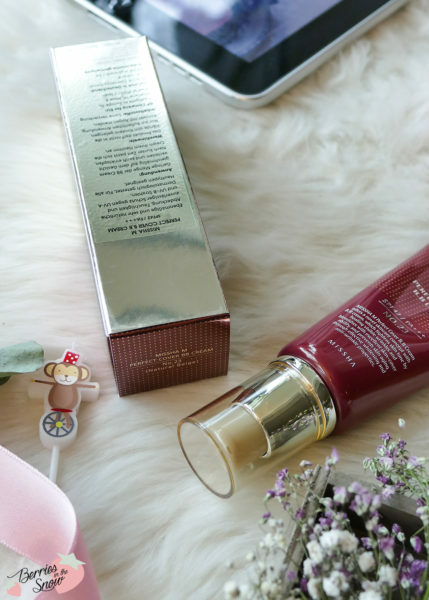 After trying some more products from Missha and other KBeauty brands like Liolele, Etude House, and Tonymoly, I discovered that it was not so easy to find reviews on the products. I decided to start a blog to write down my own experience and the first review I did was on this BB cream. It is a short and not very informative review that lacks proper images, but you will still find it somewhere buried here on my blog. Today, I want to re-do the review, and hopefully, this time it will be more informative compared to back then. 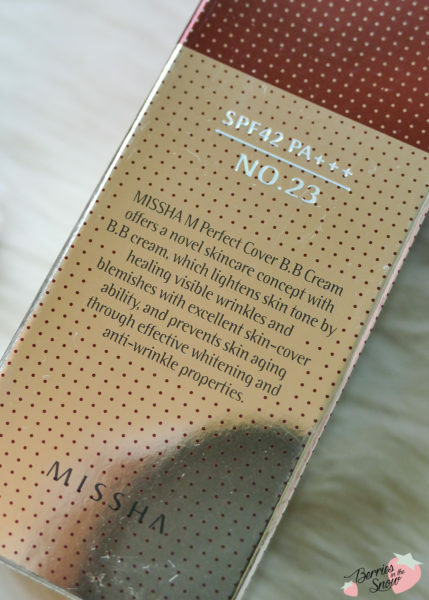 The Missha M Perfect Cover BB Cream is probably the most famous product of the Korean brand Missha. 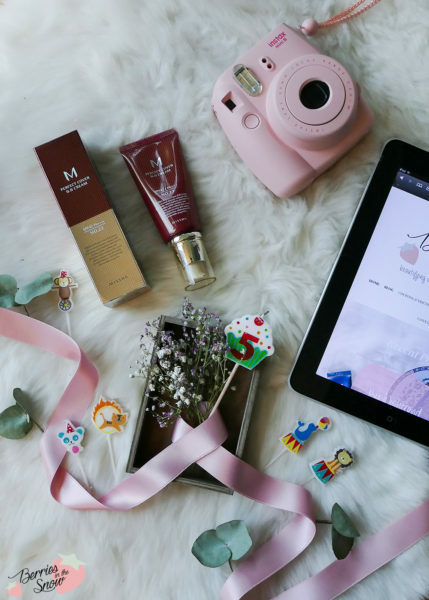 Missha has a lot of online stores all over the world and they are available in US/Canada, Australia, and even in Germany. It is the first Korean brand with a physical store in Germany, too! Missha has always been and still is against animal testing. The products usually come in a very mature and luxurious packaging and the design is very elegant and timeless. I think, that it can be liked and appeals to almost everyone! 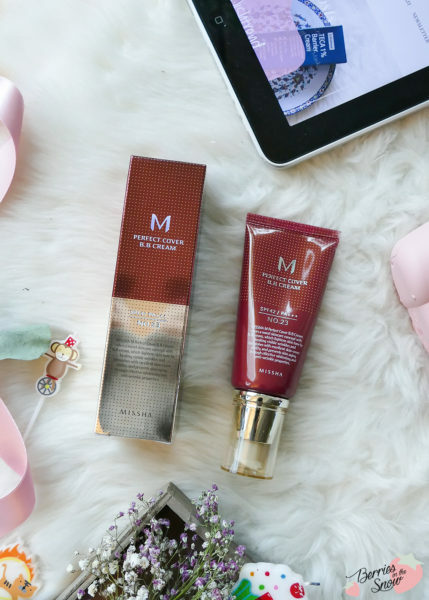 The classic Missha M Perfect Cover BB Cream comes in signature dark red and golden colors. The tube with 50 ml content comes with a pump applicator, unlike the smaller versions of the BB cream, that come in a regular tube. Usually, one pump is enough for a light and natural makeup for me. The pump is also hygienic and keeps the product from drying out, especially compared to makeup products that come in jars for example. 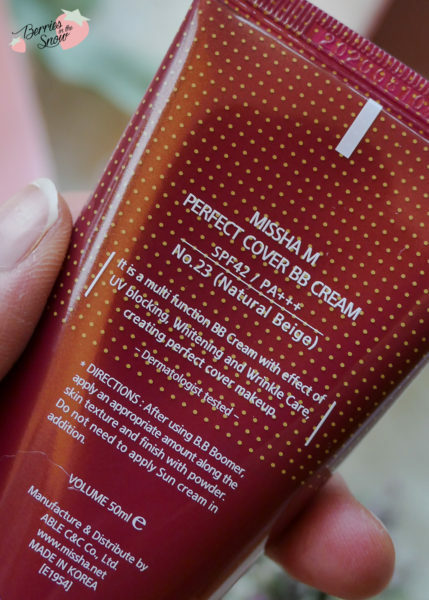 The Missha M Perfect Cover BB Cream is a multi functional BB cream. It combines skincare and makeup with sun protection. In the past I only used a moisturizer and the BB cream and I was ready to go. It did help my troubled skin so much, and after using it regularly my skin troubles improved and I was more than happy and convinced about asian beauty products. Water(Aqua), Cyclomethicone, Ethylhexyl Methoxycinnamate, Zinc Oxide, Titanium Dioxide/Talc/Dimethicone, Caprylic/Capric Triglyceride, Arbutin, Mineral Oil, Methylparaben, Propylparaben, Phenyltrimethicone, Disodiium Edta, Adenosine, Caviar Extract, Algae Extract, Rosa Rubiginosa Seed Oil, Simmondsia Chinensis (Jojoba) Seed Oil, Squalane, Hydrolyzed Collagen, Micadamia Ternifolia Seed Oil, Rosmarinus Officinalis(Rosemary) Leaf Extract, Chamomilla Recutita (Matricaria) Flower Extract, Sodium Hyaluronate, Fagus Sylvatica Bud Extract, Ceramide 3, Bees Wax (Cera Alba), Cetyl Peg/Ppg-10-1dimethicone, Dimethicone Copolyol, Polyethylene, Glycerin, Propylene Glycol, Sodium Chloride, Iron Oxides (Yellow), Iron Oxides (Red), Iron Oxides (Black), Fragrance, Hydroxyisohexyl 3-Cyclohexene Carboxaldehyde, Butylphenyl Methylpropional, Benzyl Salicylate, Hydroxycitronellal, Alpha – Isomethyl Lonone, Hexyl Cinnamal, Linalool, Citronellol. The list is quite long, but you will see that it contains a bunch of plant-based ingredients, like algae extract, caviar extract, jojoba oil…but also hyaluronic acid, collagen, cermides, and adenosin. It also contains sun protection (zinc oxide/titanium dioxid/ethylhexyl methoxycinnamate), which gives it SPF 42 PA+++. It is not free from parabens, mineral oil, or silicones though. You can check all the ingredients on Skincarisma, too. The BB cream is available in various shade options, and by now even more shades are available than they were in the past. But for me shade No. 23, natural beige, is the best suited for my skin tone and usually fits during all the year (except for vacations in very hot and sunny countries, but Germany is not that kind of country unfortunately :D). The beige colored cream has a dewy finish and medium coverage. It appears a bit grey-ish at first, but once blended in it will gradually adapt to your skin tone. I have dry skin, and the dewy finish reduced over the day while wearing the BB cream. I heard that some people with oily skin types didn’t like the BB cream because it looks greasy on them. I can advise you to get your hands on a travel size or on single samples before buying the BB cream if you worry about the greasy-ness. After all, reviews are only a personal opinion and that doesn’t mean that you will make same experiences that I have made. Below is the picture of the BB cream when blended in. And here is how the BB cream looks when I apply it on my skin. 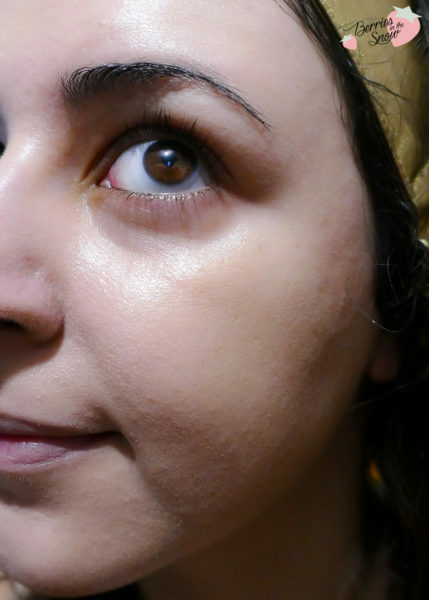 It looks so natural and nice and still has a perfect amount of coverage for me.The skin looks evened out and clear! Of course, during the day, and depending on how often you tend to touch your face, blow your nose, etc, the BB cream will start to fade, but the process can be slowed down when using a primer before. The BB cream has a flowery scent, by the way. I like the scent, but if you are sensitive to scents you should keep that in mind. 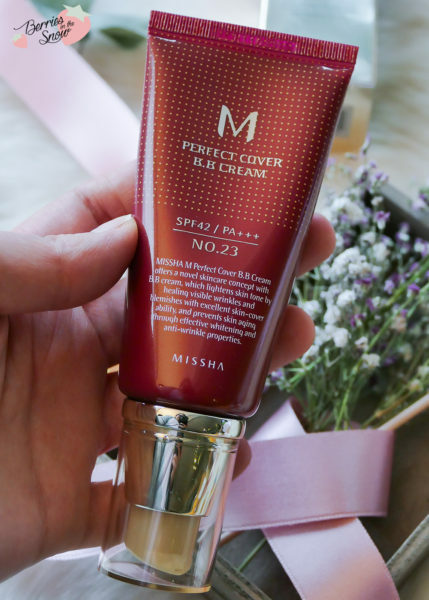 After so many years I’m still convinced by the Missha M Perfect Cover BB Cream, and though it might not seem perfect, especially regarding all the ingredients. 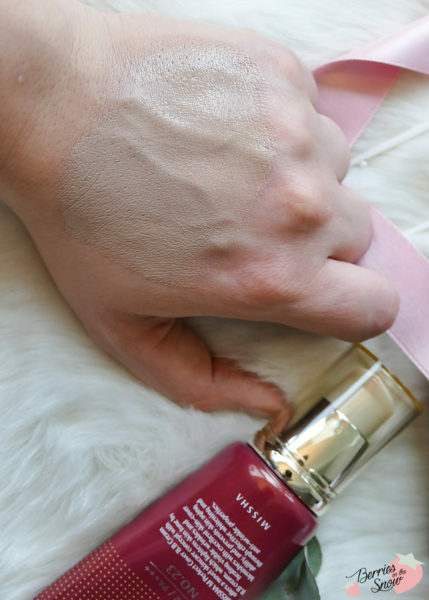 It delivers what I expect from a BB cream: it gives me a natural, but clear finish, and it is not as heavy as a foundation is. Moreover, it contains some sun protection and also some beneficial ingredients for the skin. This BB cream is like a first love for me, it will stay in your memory and make you feel happy and comfortable. Also check out my page for current coupon codes and discounts. I like your reviews, you take your time to explain your thoughts very detailed and honest. Thats why I trust them so much. Funny, that Missha’s bb cream got me into Korean makeup, too :D Was just addicted into Korean skin care before, but this bb cream got me into a whole new world, funnier and sweeter than western styled make up, wich doesn’t suit me that much, because I’m asian. I have been a follower of yours for awhile! I love all your content! I didn’t know much about this brand till I read this. Thank you for the info!! Thank you for the Instagram giveaway. My IG name is @miss_Amy_to_u76. Oh thank you! I really appreiate your words and thanks for your comment :) you should really have a look for missha products. they are one of the most famous kbeauty brands.